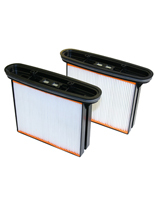 Folded filter cassette with adhered cellulose filter material and inserted rubber seal. For vacuuming household and industrial dust, sawdust, brick, drilling and milling dust, quartz sand and other similar substances with particularly good claening properties. Well suited for wet dust and liquids (plastic fleece). Special Polyester material with excellent filtration level.